Install vents in your steel building to create wind flow and ventilation. 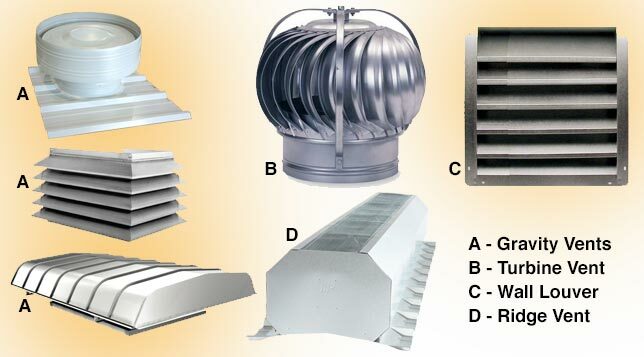 Choose from these 4 types of venting systems. When planning, designing and pricing your prefab metal garage kit you will want to consider several options and accessories you can design into any of your steel building models so when we manufacture it all these are built in to the structure. The main building features are walkthrough and overhead doors added to the end walls, Windows on the sides of the building, skylights on the roof of the arched garage kit and ventilation systems. You can also add climate control such as steel building insulation, heating and air conditioning systems with overhead vents. One important benefit of a ventilation system is reducing the condensation build up on the walls of metal buildings. It also brings in fresh air from the building exterior and circulates in the interior space. Air circulation also cools down the interior during the summer. When you strategically install the ventilation system it creates cross ventilation that moves the air throughout the building. Turbine vents are great for removing air from the building creating an up draft. These work well in workshops or auto body repair shops to remove pollutants in the interior. They also work well in summer months to remove warm air inside the building. Proper spacing is important and our technicians can help you decide how many you would need based on the roof pitch and size of the metal building. Generally speaking, the wind outside turns the turbines and creates a vacuum sucking air out of the building. Ridge vents work similar to a turbine vent but with no moving parts. Probably not as efficient but it also lets air escape from within the building’s interior and creates a nice cross ventilation. Ridge vents are flat vents usually spaced about 10 - 15 feet apart on both sides of the roof peak. If you are in a geographic area that provides high winds then the ridge vent is the best option. Gravity vents work very well moving air and contaminants out of the clear span building design also requiring no power to operate as the other ventilation systems. With your end wall openings and strategically placed gravity vents you can engineer very good air flow from prevailing winds and thermal buoyancy. Wind flow passing your building produces areas of high and low pressure. The windward end of the building is the high pressure area. The leeward end & top of the arches are low pressure areas. Having openings in the high and low pressure ends of the building causes air to flow through the metal building. By placing openings in both the highest and lowest levels of the building, hot air rises out of the top of the building and pulls cool air into the lower level of the building. Wall louvers come in several designs to handle wind driven rain from entering the building called drainable blades often ranging from 2 - 5 inches. Placed on the sides of your metal building, wind louvers produce air flow through the building from the sides. Talk to our experienced engineers and consultants to discuss the best ventilation system that is right for your type and size metal garage and for the purpose your building is being used for.